This page highlights basic operation and maintenance of the Wood Shop Dust Collection system. See the Dust Collector Design page for design basis, designs and design guidance for tool hoods, and tips and tricks for hooking in to or expanding the system. Two sheets of drywall act as a firewall between the dust collector drum and the neighboring work bench. Do not move this firewall. Flip the switch. There are 2: one to the left of the entrance to the Wood Shop, one to the right of the Cyclone. 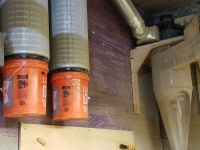 Filters are cleaned by blowing compressed air from the outside to dislodge the dust cake on the inside, waiting to let dust settle into orange buckets under the filters, then unscrewing the buckets to empty the dust. This page was last modified on 12 January 2019, at 22:59.